Sarajevo guide is brought to you in order to help you, the traveller, experience Sarajevo in a new way and to provide you with essential services in Sarajevo region. 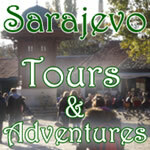 Sarajevo Guide is a division of a Dubrovnik based company, Deuscope, the makers of dubrovnik-guide.net and dubrovnikcity.com. We hope that we will provide you with the equivalent service in means of quality as we do in Dubrovnik. Some of our services are brought to you in cooperation with local agencies. However in that case we ensure that you get the best deal and discount. If you are searching for contact details go to our contact page.